President Barack Obama was trying to think of an immediate initiative that could be undertaken by the United States to foster close relations with Southeast Asian nations, when he turned towards Datuk Seri Najib Tun Razak. The prime minister told Malaysian journalists on Obama asking him about an initiative that could be implemented within a short time without involving a complex agenda. Najib promptly proposed the US-sponsored Peace Corps programme which was very popular in the 1960's to help raise proficiency in the English language among the people of Asean countries. "I said that there was a chance now to revive the American Peace Corps programme, but specifically to teach English," said Najib. Obama was instantly attracted to the Malaysian prime minister's idea and said that his mother was once an English teacher. Obama' late mother, Ann Dunham, was reported to have taught English in Indonesia. "President Obama had given a positive response, saying that personally, he understood the matter as his mother had been an English teacher (in Indonesia). "He had a deep personal experience and he seemed to welcome the idea," Najib said. Najib said he was not sure which kind of programme would be implemented but Malaysia was prepared to partly sponsor the programme of bringing in qualified teachers from the US to teach English. NEW YORK, Sept 25 (Bernama) -- President Barack Obama was trying to think of an immediate initiative that could be undertaken by the United States to foster close relations with Southeast Asian nations, when he turned towards Datuk Seri Najib Tun Razak. Najib promptly proposed the US-sponsored Peace Corps programme which was very popular in the 1960's to help raise proficiency in the English language among the people of Asean countries. Obama was instantly attracted to the Malaysian prime minister's idea and said that his mother was once an English teacher. Obama' late mother, Ann Dunham, was reported to have taught English in Indonesia. The Peace Corps is an American volunteer programme which includes three goals: providing technical assistance, helping people outside the United States understand US culture, and helping Americans understand the cultures of other countries. "I said that there was a chance now to revive the American Peace Corps programme, but specifically to teach English," said Najib. The prime minister told Malaysian journalists on Obama asking him about an initiative that could be implemented within a short time without involving a complex agenda. The question was posed by Obama to Najib while chairing the second Asean-United States meeting attended by eight heads of government from Asean countries in New York on Friday. The meeting was called by Obama when the Asean leaders were visiting New York to attend the United Nations General Assembly from Sept 23. Obama who attended the second Asean-US meeting in Singapore last year is seen as trying to get the US to be closer to the Southeast Asian nations which have huge trade potential, besides expanding US influence in other areas, especially security. 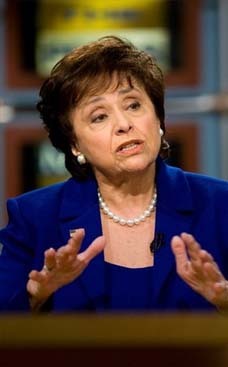 "President Obama had given a positive response, saying that personally, he understood the matter as his mother had been an English teacher (in Indonesia). "He had a deep personal experience and he seemed to welcome the idea," Najib said. During the two-hour meeting, Najib was seated not far from the US president, only with Philippine President Benigno Aquino III seated in between them. The other Asean leaders present were Singapore Prime Minister Lee Hsien Loong, Thai Prime Minister Abhisit Vejjajiva, Cambodia Prime Minister Hun Sen and Sultan Hassanal Bolkiah from Brunei Darussalam. Najib said he was not sure which kind of programme would be implemented but Malaysia was prepared to partly sponsor the programme of bringing in qualified teachers from the US to teach English. 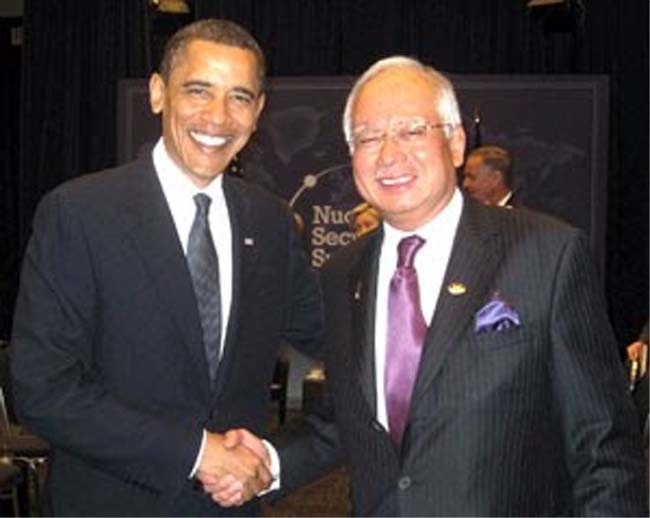 In April, Najib had a 40-minute meeting with Obama in Washington before attending the Nuclear Security Summit. On Asean-US relations, Najib said the superpower realised the need to outline its strategies to enable it to play a meaningful role in Southeast Asia. The avenue for the US to work closer with the governments in this region is wide open now after the 10-nation grouping accepted the US and Russia as partners in the East Asian Summit at its meeting next year in Vietnam. Najib said Malaysia hoped the US could play a role in areas where it had the edge such as science and technology, education, counter-terrorism and maritime security. Najib regarded the Obama administration's desire to enhance relations and cooperation with the Southeast Asian governments as recognising the importance of Asean, especially in the region's rapid economic development. The US has also been reported to be wanting maritime security in the region, especially in the South China Sea, to be ensured as it is a major international trade passage. Before the Asean-US meeting, Najib held separate meetings with President Aquino and Sri Lanka President Mahinda Rajapaksa. During his meeting with Aquino, Najib invited him to visit Malaysia. Najib said the Philippine leader hoped that Malaysia would continue to be the facilitator for negotiations to resolve the political conflict in Mindanao. The prime minister also proposed to Aquino for the Philippine government to set up a consulate in Sandakan, Sabah. Rajapaksa, meanwhile, hoped that Malaysian investors would venture into more sectors in Sri Lanka as the security situation in that country was good now. 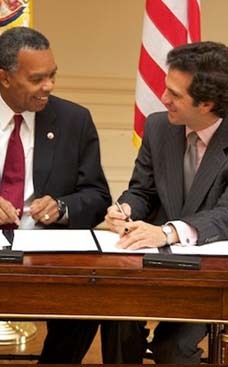 The Peace Corps has always neglected the third goal, allocating less than 1% of their resources to it, so when Aaron Williams promised Senator Dodd to provide a "Comprehensive Assessment Report" with ideas to strengthen and reform the agency's operations we expected to see some forceful recommendations to address this critical weakness. Read the report and our commentary on the big omission in the third goal that committee members didn't address, discuss, or even mention.